Suitable for all types of mobile phone and GSM networks. The small and handy CHIPDRIVE® SIM Card Stick is the ideal power tool for all those who want to manage and edit the data on your SIM card on your PC. Phone numbers, text messages, and set-up data can be read, edited and stored on the SIM Card in no time; you no longer have to perform awkward operations on the mobile phone itself. You only plug the CHIPDRIVE® SIM Card Stick into a free USB port. The CHIPDRIVE® SIM Card Stick supports all relevant security standards and facilitates multiple security applications, for example PKI (Public Key Infrastructure), digital signatures and personal identification – all in a compact mobile device. The CHIPDRIVE® SIM Card Stick reads and writes to all ISO 7816 compliant SIM, SAM and smart cards in plug-in format (ID-000). Other smart cards can be placed into the reader, if tailored to the correct size by the user on his or her own responsibility. you can manage and edit the data on your SIM card in no time. 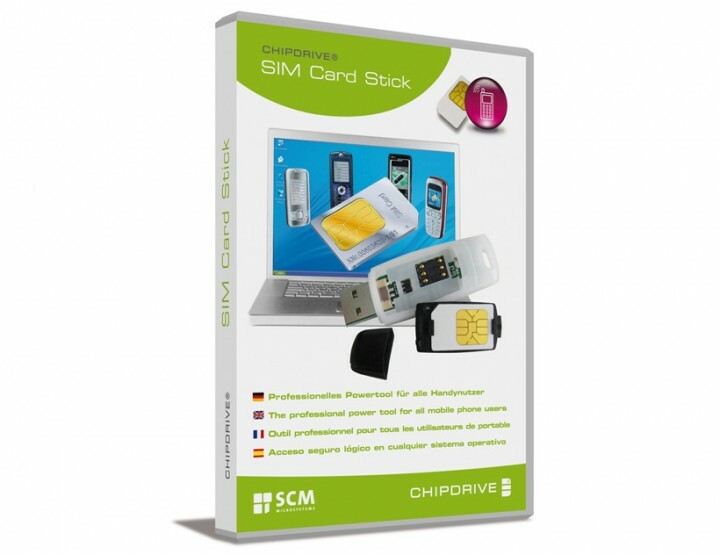 The compact CHIPDRIVE® SIM Card Stick supports relevant security standards. It reads and writes to all ISO 7816 compliant SIM, SAM and smart cards in plug-in format (ID-000). The new CHIPDRIVE® MyKey™ was especially developed for notebook users to automatically and easily protect their privacy and sensitive data. Sensitive information – for example passwords and personal information – are stored on a smart card in plug-in format (ID-000). Insert the handy CHIPDRIVE® MyKeyTM-Stick with the included CHIPDRIVE® Masterkey 24k in any USB slot, enter your PIN – and you immediately have access to your data. Remove the stick from the USB slot again – and your sensitive data is promptly protected. 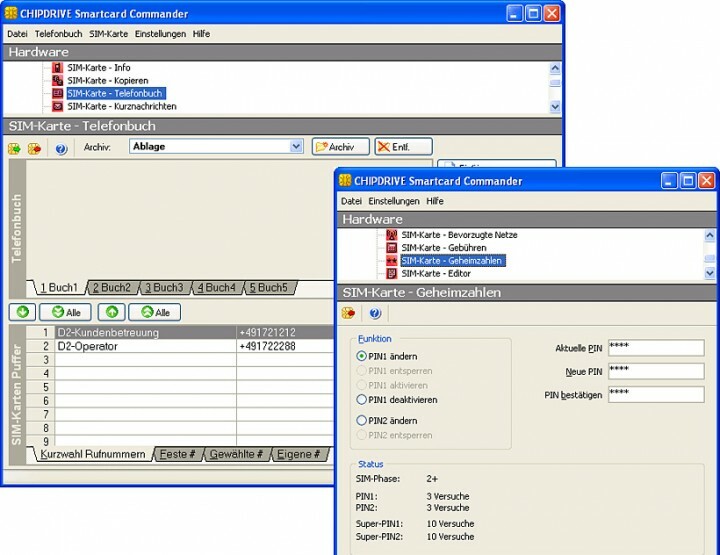 CHIPDRIVE® Smartcard Manager is the central control center with Plug & Play and card backup. In the expert mode you can control all of the settings, for example which functions shall be executed or how the smart card itself shall be protected. CHIPDRIVE® Password Manager stores all your passwords on the smart card. Password dialogs will be answered easily without drag & drop. CHIPDRIVE® Form Fill stores your personal data (e.g. name, address, phone number) and at your request can automatically fill in Internet-based forms for shopping, registration, etc. CHIPDRIVE® Address Book stores your favourite Internet bookmarks so you can take them with you wherever you go. CHIPDRIVE® Notepad encrypts and stores your personal notations to keep them confidential and protected from unauthorized access. 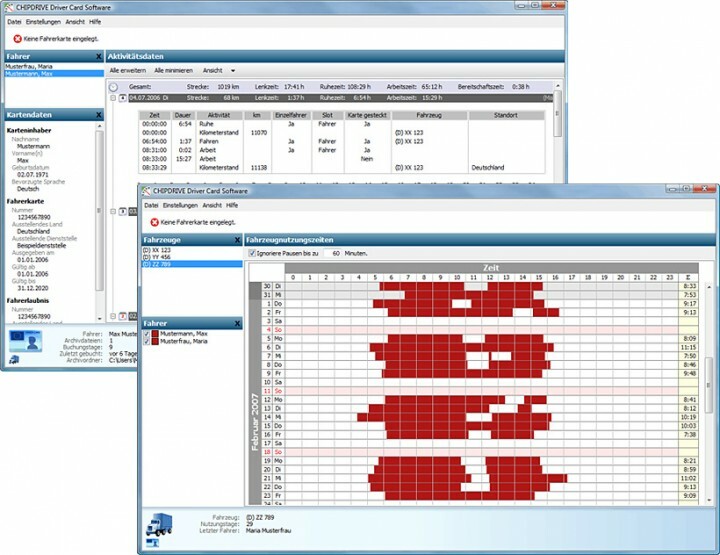 With the new CHIPDRIVE® Driver Card Software, drivers now can use a notebook computer to read out this information and call it in from the road, ensuring that proper rest periods are being observed and allowing transport companies to better track the location and status of each driver. If desired, the driver can also transfer the data using a notebook – simply via email with only one click. The software module displays all relevant data and can create private backup files for the user. It is possible to show and manage the data from an unlimited number of people. Data of a new person are saved automatically when inserting the driver card in a smart card reader. The data can not only be archived after a pre-defined time period, but can be later looked at. Furthermore, there is a second page listing all vehicles and the person who has moved them when and how long. Though such extensive functions, the ease of use is very high: the handling is simple and the graphic design is logic and easy to understand. digital driver cards inserted into the included CHIPDRIVE® mini (SCR3310v2.0) or compatible smart card reader. 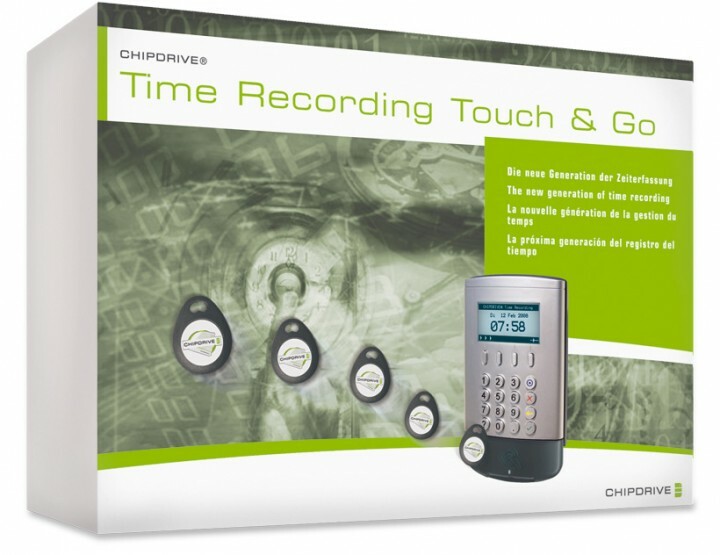 The network-based solution CHIPDRIVE® Time Recording Touch & Go allows employees to clock-in, clock-out and record time spent on specific projects with a mere touch of the CHIPDRIVE user chip token to the time recording terminal – eliminating the need to carry and swipe time cards. The entire operation takes just milliseconds. All clocking data are directly transferred to the server and are at the same time stored at a smart card. The new solution enables permanent access to current booking times of your employees. Can be extended to more than several hundred employees. 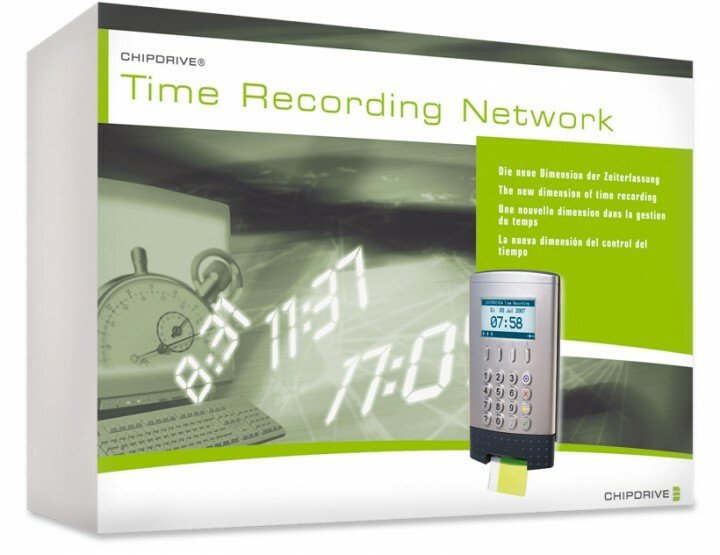 The CHIPDRIVE® terminal 920 DI enables the recording of the current booking times. 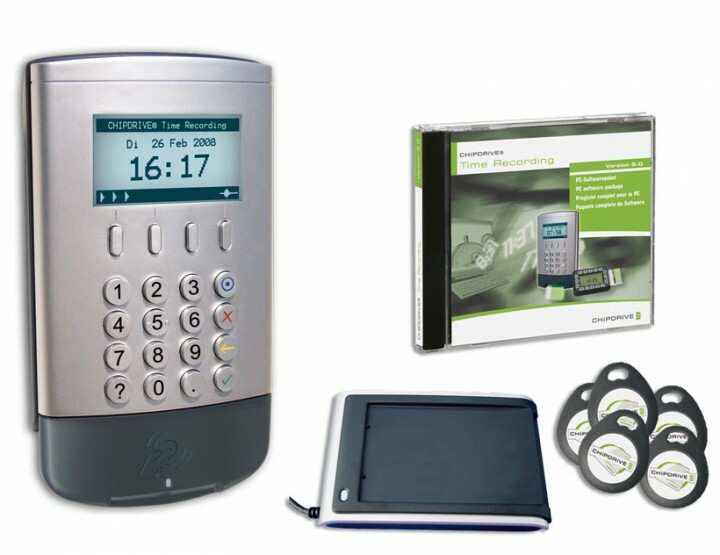 The terminal incorporates a dual interface that accommodates both use chip tokens and smart cards. It is either installed on the wall or can be used as a tabletop device with an optional stand. The device will be configured via web interface and connects with the local area network to transfer all clocking data directly to the server. The time is constantly adjusted with the server. Even if the connections are interrupted, employees can continue clocking in and out, as there is a local data buffer. CHIPDRIVE® terminal includes a simple and intuitive menu and a graphical display that shows the date and the time, current clocking data as well as the time balance of the employee. Individual project numbers can be set using the key pad. 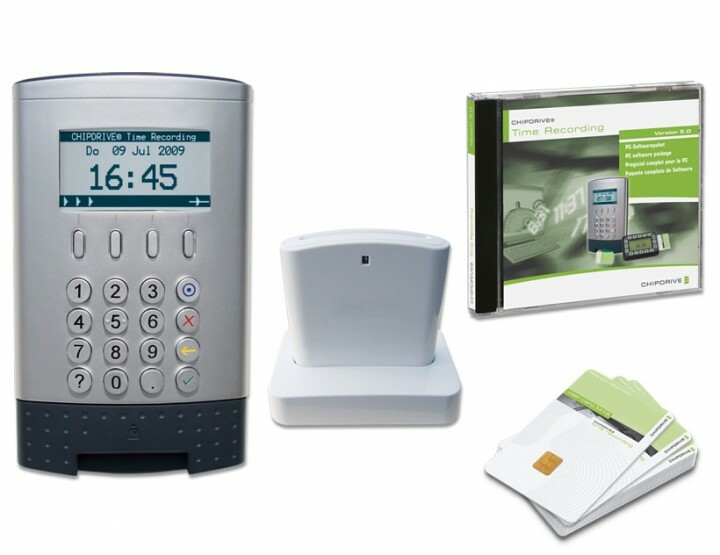 This smart card readers is used to personalize the user chip tokens and the user cards. CHIPDRIVE® Time Recording Software is the extensive and efficient software to analyze the booking data of your employees. Every employee uses the user chip to clock-in, clock-out and record time spent on specific projects. The new dimension of time recording! The network-based solution CHIPDRIVE® Time Recording Network enables permanent access to to current booking times of your employees. All clocking data are directly transferred to the server and are at the same time stored at a smart card. The device is installed on the wall or can be used as a tabletop device with an optional stand, which ensures easy clocking in and out. CHIPDRIVE® Time Recording Network is applicable everywhere – in the office, in agencies, factories or production facilities, and en route. 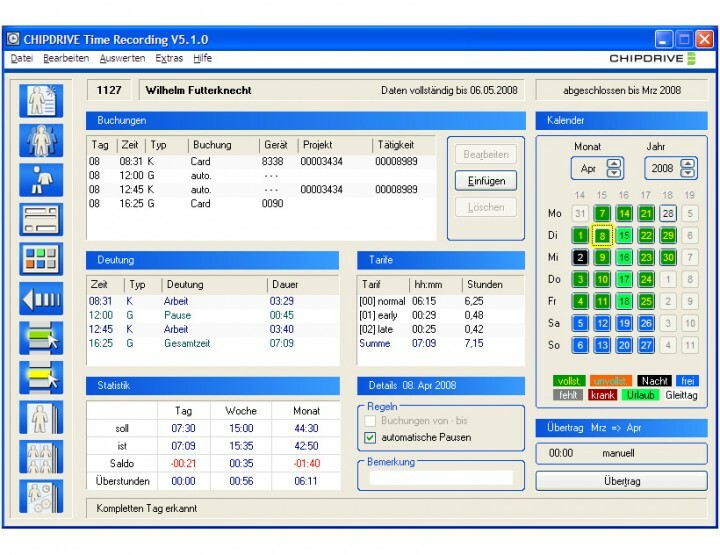 CHIPDRIVE® terminal enables the recording of the current booking times. It is either installed on the wall or can be used as a tabletop device with an optional stand. The device will be configured via web interface and connects with the local area network to transfer all clocking data directly to the server. The time is constantly adjusted with the server. Even if the connections is interrupted, employees can continue clocking in and out, as there is a local data buffer. The token reader from CHIPDRIVE® is used to create employee cards. Every employee is issued a user card. It is used to clock working hours. 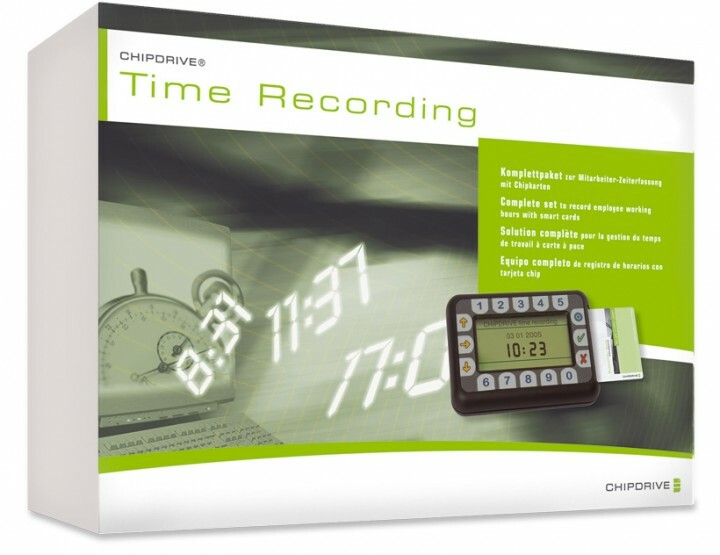 CHIPDRIVE® Time Recording is the incredibly reasonable priced solution for small and medium-sized companies to record the working hours of all employees. Mobile or stationary, professional, simple, and secure against tampering and misuse, excellent reporting features. Ideal for use in offices, production, agencies, construction, service or business. A "clock in" or a "clock out" is logged on this handy device; up to 1,200 clocking entries can be stored temporarily. The device is battery-operated and features a large graphic display that not only shows the time and date, but also the current clocking data. Project numbers can be entered via the keyboard; the menu guide facilitates the ergonomic operation of all functions. 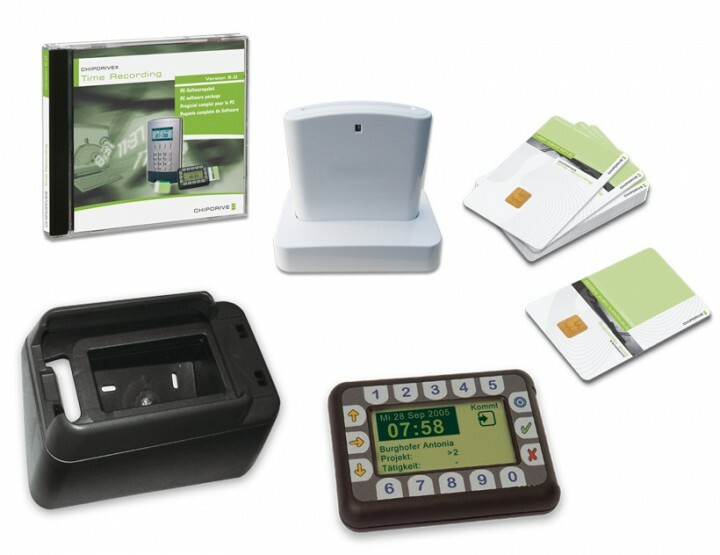 Thanks to the unique ID, numerous CHIPDRIVE® mobile 910 can be used together. With the wall mount you can easily apply the CHIPDRIVE® mobile CDO910 for your stationary use. 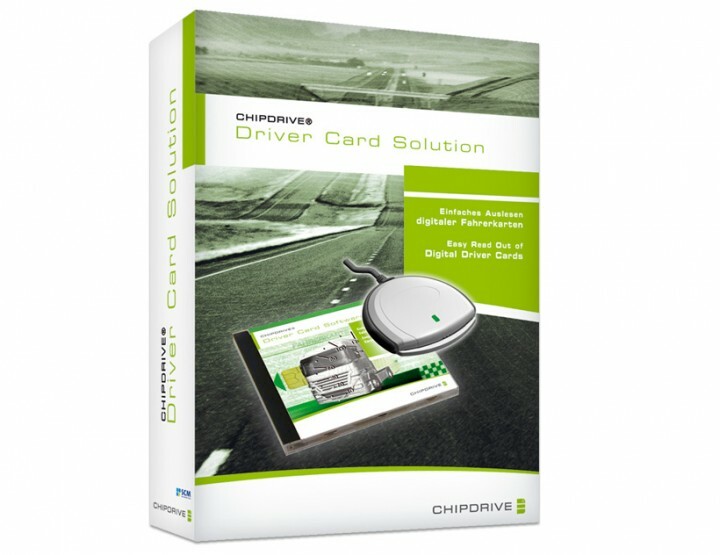 The token reader from CHIPDRIVE® is used to read the transport card and to create employee cards. With this memory card, you retrieve data from the CHIPDRIVE® mobile CDO910.